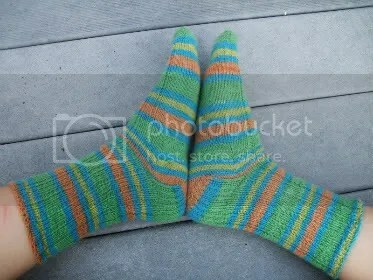 FO: Sassy Stripes Socks | Stitch, Brinn, Stitch! 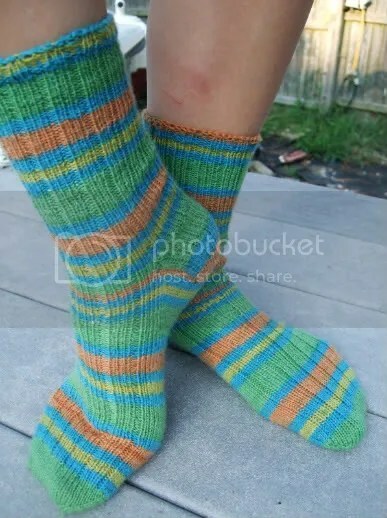 I finally finished my ribbed socks! Pattern: None. It’s a ribbed toe-up sock. With a gusset/flap heel. They came out pretty well and were fittingly mindless to keep in my purse. I liked knitting them. As I said, I’m not crazy about the colors, but the yarn was cheap and they’ll go in my shoes. One of them is a little snug in the leg because I accidentally decreased too many to make the ribbing work above the heel, but it’s not so tight I can’t wear it. They’ll be perfect come winter time. Speaking of winter, my next project that I’m about to cast on for is a simple pullover for winter–grey and purple two row stripes, short v-neck, seamless set in sleeves. I also have a couple of swap stuff for OWS coming up, as well as a possible personal swap on Craftster and my boyfriend’s birthday present. Which is largish but doesn’t need to be finished until December, so I’ve got plenty of time. In other news, I am moving back to school TOMORROW. And I’m totally thrilled. Especially to set up all of my crafting stuff in my crafting corner, which I will totally show you all pictures of when it’s all set up.